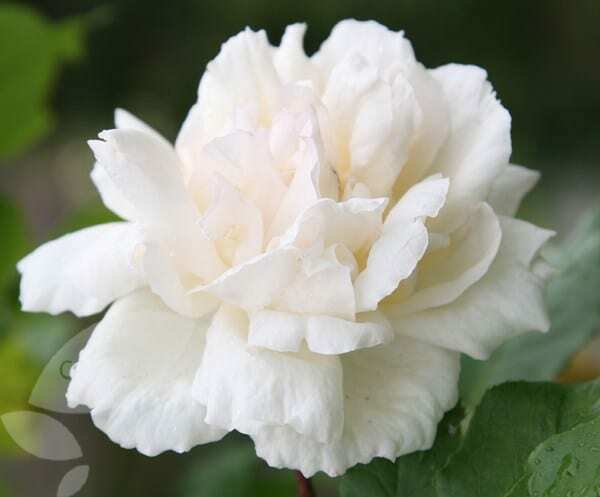 Fragrant, fully double, white to pale pink flowers from July to September and light green leaves. 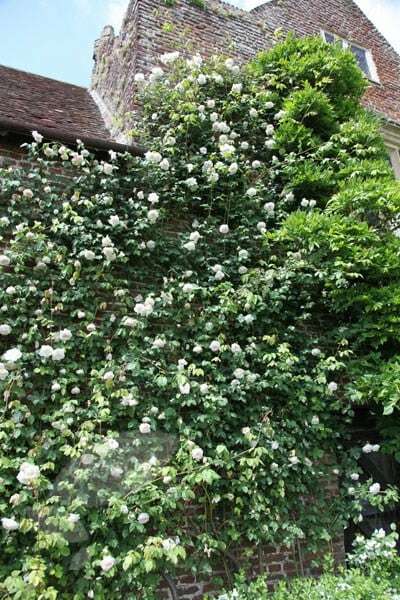 This reliable, repeat-flowering, old climbing rose is ideal for a north-facing site. 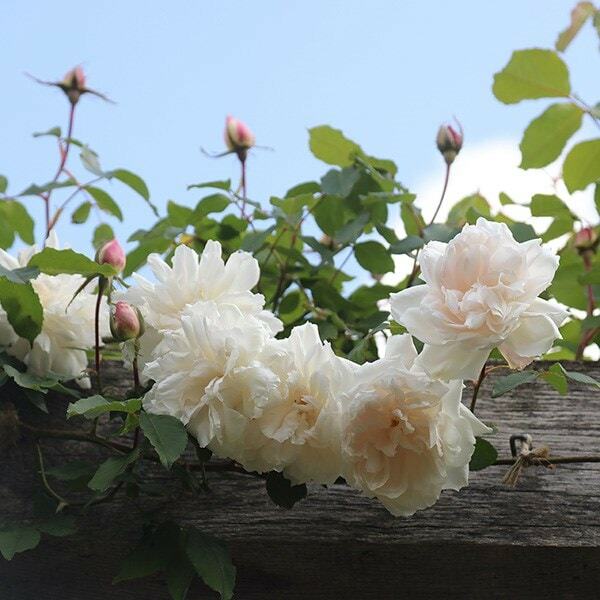 A popular and hardy climber since Victorian times, its slender, pliable stems are particularly suitable for training over a rose-arch, fence or wall. I've had this rose since the spring of 2015 and despite all my best efforts it doesn't want to flower. Its large and healthy, i've bent the stems and they produce lateral shoots only to go on to produce more and more leaves. I feed it tomato feed every fortnight during the summer and it still looks like it will still have no flowers this year! I only had two flowers from it last year (and that's the only time). I have a south facing garden so it gets full sun for about half the day before the buildings block the sun as it moves round, but it is never in shade and open to the sky. I'm a patient gardener but i'm wondering what else to do without it now as it was meant to be the focal point of the garden! I have two other roses and a climber which produce bountiful amounts (queen of sweden, the generous gardener, claire austin). Looking really good on a rather shady east facing fence. Flowered a few weeks after being planted. Easy to train along the fence. This is a lovely rose, strong growing and scented, which I have planted to cover a shed. It is showing new shoots and has survived well in a difficult position. Reasonably flexible so easy to tie in. Very impressed with the fast friendly service. My rose arrived in perfect condition. Must admit to being pleasantly surprised at how beautiful this rose was. Perfectly healthy and growing and climbing up the house strongly. We love it. Would definitely recommend Crocus, quality of plants, delivery and communication always top notch. Grew very well in the first season with no checking. Even a few flowers. I grew this rose up onto a pergola. Good growth and creamy white flowers with a tinge of pink after only the first year. Not as many thorns as other roses. This lovely rose blooms throughout the summer; there are masses of flowers and there is plenty of deep green foliage for added interest. It's a vigorous grower which is helpful if you want a good display within a couple of years. An added bonus is that it is fragrant. I have two of these roses and they have both been reliable and with good disease resistant. I can't really find any fault with this rose - I love it! I have had a Mme Alfred Carriere rose from crocus for ten years. It has been exceptionally healthy and bug resistant. It flowers almost constantly, even in the winter, is tolerant of neglect, frost and heavy pruning. It is a strong grower but not so rapid as to be overwhelming. I have planted it in a sunny south facing spot in our garden in south Devon and it is regularly admired, The branches can be made to arch over very attractively to create a bower or similar. just about to order my third even though the first is going strong as they re such a great gift. I have planted this rose against a south facing wall. Is there anything you would recommend to grow under it? Hello, While this rose is more shade tolerant than most, I do not think that a spot beneath a weeping willow would be suitable for any of the roses. Hi. I bought a couple of these roses for a North East facing wall last November. They have grown well but not flowered - I didn't really expect them to in the first year but can you tell me if I should prune them now or leave them alone. Should I expect them to flower next summer and is there anything I can do to help them along? Thank you. Hello there The ideal time to prune climbing roses is from late autumn to late winter, but it is often a good idea to prune in the autumn so you can cut out any dead, damaged or weak stems, and tie in any that are loose so they don't get caught by the winter winds. Hopefully as long as your roses are getting enough sun they should flower next year, but you can always give them a bit of a push by feeding with a high potash feed in the growing season. I would like to grow this rose in a container against a balcony wall that doesn't get direct sun and is always shaded - I would say light shade. Does the colour of the wall matter? Am considering painting it a dark colour (currently white) and wondering if by absorbing light it would have effect on the growth of the plant. Many thanks. Hello, The colour of the wall will not have a significant impact on the roses growth, however this rose (like all the climbing roses), will not be happy in a pot for more than about a year. 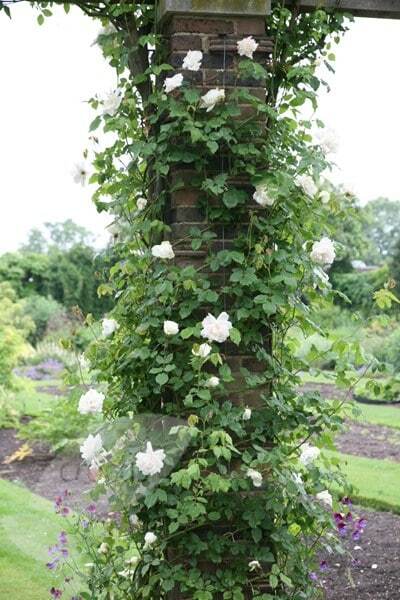 If you want a longer term climber, then I would opt for one of the smaller Clematis. Hi, I planted this rose which was a gift in late March and it is growing very well. Only thing is it has not flowered and doesn't even have any buds yet. I have placed it against a fence panel and it gets all the afternoon sun. The other rose that came at the same time (Albertine) has flowered beautifully and my other roses are in full flower. Is this a late flowering variety? Hello, These generally start flowering in midsummer, so you should start to see some flowers soon. You can also give it a bit of a push by feeding with a high potash fertiliser such as Tomorite or Sulphate of Potash. Hello, This rose will often bloom from July to September, and it will usually produce more if the spent flowers are removed as soon as they have faded - ideally cutting back the stem to the first leaf. Hi there, I bought one of these in a 4l pot and have just planted out. I just wondered how long after planting we can expect flowers? I am planning to put some feed in to help it (high potash) as we don't get much sun in this spot. I know all plants will vary but just looking for a rough estimate on how long they take to flower. - thanks! Hi I need to replace a climbing Rose that has been plagued with mildew and black spot, have done everything to try to prevent it to not avail. Would this Rose work? It would be against a fense in a south west facing city garden in Glasgow? Hi, I have a north facing fence that I need to cover. I need a plant that will grow well in a container so soil type isn't an issue as this area is decked, but it must be safe for dogs - mine have a tendency to chew my plants. I was hoping for a highly scented plant. It will be meeting up with a purple clematis viticella that is netted off in a border. Have you any suggestions please?